Benedictine Father Timothy Sweeney, a monk and former archabbot of Saint Meinrad Archabbey in St. Meinrad, died on Aug. 17 at the monastery. He was 82. The Mass of Christian Burial was celebrated on Aug. 22 at the Archabbey Church of Our Lady of Einsiedeln. Burial followed in the Archabbey Cemetery. Father Timothy was a jubiliarian both of monastic profession and ordination. He had lived as a monk for 61 years and as a priest for 56 years. After serving for a decade on the faculty at the former Saint Meinrad College and in different leadership positions in the monastery, Father Timothy was elected on June 2, 1978, as the seventh abbot and fourth archabbot of Saint Meinrad Archabbey and served as its leader until he resigned in 1995. That same year, Father Timothy began nearly 20 years of parish ministry in the dioceses of Gary, Ind., and Owensboro, Ky., and in the Archdiocese of Indianapolis. Archabbot Kurt began to learn the “Benedictine way” from Father Timothy, who was Saint Meinrad’s novice master when the current archabbot entered the monastery in 1975. “I enjoyed teasing him, especially this last year, by reminding him that when he was my novice master he told me three times I’d never make it to Christmas,” Archabbot Kurt joked. Archbishop Charles C. Thompson came to know Father Timothy when he was a seminarian at Saint Meinrad from 1982-87 when Father Timothy was serving as archabbot. He also noted the “creativity and growth” of the monastery under his predecessor’s leadership. During Father Timothy’s tenure as archabbot, the monastic community built a new monastery and library, renovated the former monastery, which is now St. Anselm Hall, for use by the seminary, and began the process for the renovation of the Archabbey Church. He also led the expansion and formalization of the mission of Saint Meinrad’s Abbey Press and the former Saint Meinrad College. Benedictine Father Justin DuVall, vice rector of Bishop Simon Bruté College Seminary in Indianapolis, served as prior (second in authority) under Father Timothy from 1984-95. He said that, although Father Timothy’s legacy at Saint Meinrad can be seen clearly in brick, sandstone and mortar, he also helped the monastic community grow in its faith and living out the Benedictine charism. After his ordination in 1998, Father Beidelman continued to be influenced by Father Timothy in the way his cousin served in parish ministry. Father Beidelman seeks now to carry on his cousin’s legacy and has a tangible reminder of him in a chalice he frequently uses in the celebration of the Eucharist. It had belonged to Father Timothy’s brother, Father James Sweeney, an archdiocesan priest who died in 1990. Robert Joseph Sweeney was born on July 24, 1935, in Indianapolis and grew up as a member of St. Philip Neri Parish on the city’s near east side. After spending six years in the former Saint Meinrad High School and College, he was invested as a novice in the monastery on Aug. 14, 1955. He professed simple vows on Aug. 15, 1956, and solemn vows on May 7, 1959. Father Timothy was ordained a priest on May 7, 1961. He earned a bachelor’s degree in philosophy at Saint Meinrad College and a master’s of divinity degree at Saint Meinrad Seminary and School of Theology. After ordination, he earned a licentiate in sacred theology at the Pontifical Athenaeum Sant’ Anselmo in Rome, and a licentiate in philosophy at the Institute Catholique in Paris. From 1968-78, Father Timothy taught philosophy at Saint Meinrad College. During that same time, he served from 1970-75 in the monastic community as subprior (third in authority) from 1970‑75, novice and junior master from 1972-75 and as prior starting in 1975. 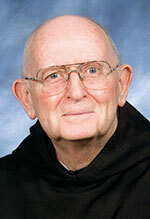 In 1978, the monastic community elected Father Timothy as Saint Meinrad’s seventh abbot and fourth archabbot. After resigning as archabbot, Father Timothy served for some two decades in parish ministry. In 1996, he served as administrator of Our Lady of Perpetual Help Parish in Hammond, Ind., in the Gary Diocese. In that same year, Father Timothy began service as pastor of the Parish of the Immaculate in Owensboro, Ky., which he served until 2005. In the archdiocese, Father Timothy served as administrator of St. Bridget of Ireland Parish in Liberty in 1995; as pastor of St. Paul Parish in Tell City in 2006-09; and as administrator of St. Charles Borromeo Parish in Bloomington in 2011. From 2013-14, he was the sacramental minister of St. Isidore the Farmer Parish in Perry County. And from 2014-17, he ministered as the administrator of St. Isidore Parish and St. Martin of Tours Parish in Siberia. Father Timothy taught philosophy at Saint Meinrad from 2009-11 and, beginning in 2012, maintained and managed the archives of Saint Meinrad Archabbey and the Swiss-American Congregation, a group of monasteries to which Saint Meinrad belongs.